Almost twenty years ago when I decided to step into the world of newspaper publishing, everyone, especially my family, wondered whether I had lost my mind. I too would have had second thoughts about what I was getting myself into, but being the determined person as I am, never backing off from challenges, I decided that I was not changing my mind and the newspaper must be published. Now I’m really happy that I didn’t. I was born in Phitsanulok where my father owned a successful business. When we were still young, he decided to make it bigger and moved to Bangkok. During the Vietnam War era, my father set up tailor shops in Bangkok and at U-Tapao where my brother Marlowe and I respectively started our business careers. As you can well imagine we came into contact with English speaking foreigners (Americans) at a very young age. At the end of the ‘war’ as the US troops were being pulled out of the many bases in Thailand, shopkeepers looked for newer pastures to set up shop to operate their businesses. Most of them were dealing with US troops and therefore it was relatively easy to switch to the European tourism market. In those days the Germans and the Brits were the predominant tourists to Thailand. The main tourist destinations after the ‘war’ were Bangkok and Pattaya, long before Phuket or any other tourist resorts were heard of. My family moved to Pattaya in 1975 where we set up shop in South Pattaya, now known as Walking Street. The original shop next to the ‘big tree’ still stands. It is called Sir Marlowe. My younger brother Bill runs it. During the almost two decades of fun and games in Pattaya I saw that the community was growing and it was not just the influx of locals but the expat community was also growing in leaps and bounds. Having had close contact with foreigners for so long, I had gained their trust and many became my close friends. It didn’t matter whether they were here for a few days or had come to live here for the rest of their lives, there were always questions popping up about the various aspects of life in Pattaya and Thailand as a whole. It suddenly dawned on me that the foreign community were desperate for information about the town and country that they had come to call home. Something was missing… yes! …an English language newspaper. Not just any rag, but a decent newspaper. 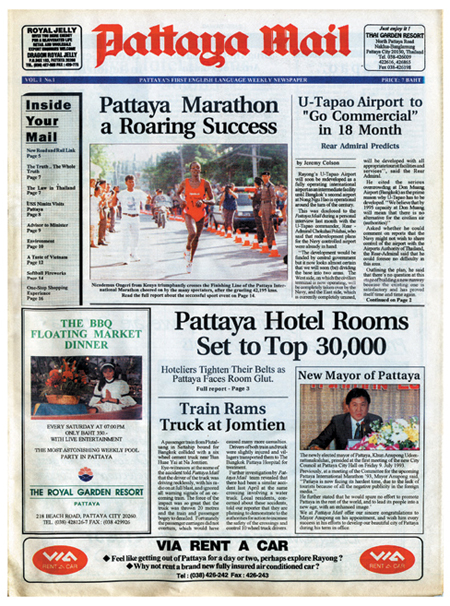 When the inaugural issue hit the streets on July 23, 1993, Pattaya Mail became the first English language newspaper in Pattaya and the Eastern Seaboard of Thailand. Since then, Pattaya Mail has enjoyed a steady growth, and our readership base, which was once restricted to only Pattaya, expanded to include the entire Eastern Seaboard and other regions in the Kingdom. Topics covered in each issue of the weekly newspaper include bold yet fair reporting on governmental issues, the local administration, crime and the constant expansion of Pattaya and the Eastern Seaboard. Pattaya Mail also realises its role as a community minded newspaper and each week reserves space for community happenings, social events, local sports, and an adequate amount of features and informative pieces created by some of the area’s best writers. We are especially proud of having been able to expand our readership via the World Wide Web. 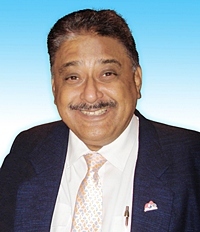 In 1999 we ventured into the electronic media with the establishment of Pattaya Mail on TV, broadcast on cable TV networks in Pattaya and our neighbouring communities. In 2002 we launched the Pattaya Blatt newspaper in the German language and the Chiang Mai Mail to serve the north of Thailand. On the eve of our twentieth anniversary, I look back at the past 19 years with a smile and a tear in my eye. What a tremendous ride! Not unlike little Dorothy skipping and running along the yellow brick road picking up friends along the way on her way to see the wizard, I too can proudly say that we have also befriended a team of outstanding journalists and co-workers during the past decades who enjoy and believe in the same ideals as we all do at the Pattaya Mail. They are not just friends or colleagues anymore, but have become a part of our family. Men like Dan Dorothy, our Executive Editor, who not only looks after the paper but has also become a world renowned author having published a novel called Mango Rains. Martin Bilsborrow, our untiring Assistant Editor in charge of sports, classifieds and entertainment. Paul Strachan our wee Scottish brother and of course Dr Iain Corness, who writes about anything and everything. He claims he is not a cardiologist, but I believe that he knows more about matters of the heart than he lets us believe. Peter Cummins, our evergreen yachting scribe who always has his nose to the grindstone and the perfect tack into the wind. Elfi Seitz, our charming Austrian executive editor of the Pattaya Blatt. Sue K., the sweet ‘girl’ of PMTV who can ‘hard talk’ the toughest interviewees into submission. Shana Kongmun, the brave and tenacious Managing Editor of the Chiang Mai Mail who refuses to give in to all odds and has kept our flag flying high up north. Then we also have our brave and loyal inhouse staff, some of whom have been with us from day one. There are so many, and I couldn’t even begin to name them. Our new generation of leaders include my sons Prince, Tony and Dave, all of whom have grown to love and respect the Pattaya Mail and realise what it means to the community, their family and most importantly, to themselves. They sure do have a tough act to follow, but I don’t really believe they’re followers. They are already far ahead of the game. The Pattaya Mail Media Group is deeply indebted to all of you. Without you we could not have come this far. We look forward to the inevitable evolution the future has in store for all of us with sincere optimism. I take off my hat to you. “May the road rise up to meet you. May the wind be always at your back. May the sun shine warm upon your face. May the rains fall soft upon your fields. May you know nothing but happiness. May the warm rays of sun fall upon your home. May the hand of a friend always be near. May green be the grass you walk on. May blue be the skies above you. May pure be the joys that surround you. May true be the hearts that love you. May God hold you in the palm of His hand.